On his last day in power, with a blizzard threatening 18 inches of snow, Sheriff Bittersmith’s is called to the scene of a crime. A farmer has been stabbed clean through the neck with a pitchfork. Two sets of tracks lead from the barn, and the dead man’s frantic wife exclaims her daughter is missing. Convinced it was Gale G’Wain, the orphan who worked at the farm, Bittersmith follows the vanishing footprints into the storm. Three miles away, Gale G’Wain is alone and close to dead. He’s holed up in an empty farmhouse, half-dressed and nearly dead after falling through lake ice. Innocent, but unlikely to ever stand trial in a town as corrupt as Bittersmith, he loads his gun and prepares to defend himself against the dead man’s bloodthirsty sons and the Sheriff’s Department. Set in small town Wyoming in the 70s and unfolding in a single day, Clayton Lindemuth's debut novel, Cold Quiet Country, explores small-town corruption and the lengths some people will go to exact revenge. 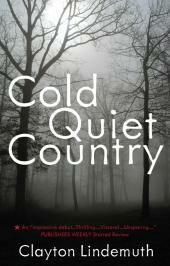 Like Cold Quiet Country on Facebook for news and reviews. Featured on the December 2012 Indie Next List. "...Lindemuth carefully weaves characters’ backstories into this thrilling narrative, and his visceral prose and unsparing tone are wonderfully reminiscent of such modern rural noir masters as Tom Franklin and Donald Ray Pollock." "Cold Quiet Country is not an easy book to read. Dealing with such everyday horrors...it is not written for the faint-hearted. And yet, I couldn’t stop reading it. I would put it aside thinking I couldn’t take it any more, but then after a while, I would pick it up and keep reading, hoping life would improve for its characters." "Clayton Lindemuth’s stunning first novel is all about good hunting down evil on a snowbound day, but the writer overturns common notions about good men in the moral darkness...Lindemuth succeeds in contrasting light and dark, innocence and depravity, and the picture he paints is representational..."